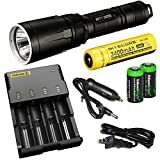 There isn’t really anything bad about this flashlight at all, except for the price, because $75 for a flashlight isn’t cheap. 2) Tough and reliable, IP65-rated water resistant and designed for use in heavy rain Its durable aluminum body and shock-resistance endure rough handling. It puts out an astounding 4100 lumens of white light! The manufacturers say this torch is bright and powerful enough to actually fry an egg! Use this power to guide your way home, light a fire, or even fry an egg! The TN12 2016 Flashlight runs on 1 x 18650 --- Adopts latest Cree XM-L2 U2 LED combined with new designed ThruNite drive up to 1050 ANSI lumen. Neutral white output will be 20% less than cool white. TN12(2016) has the better LED focus function than TN12(2014). Investing in a Cree LED Flashlight always mainly revolves around your budget, and then obviously also around what you’ll be using it for. 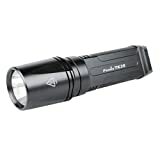 There are tons of great flashlights available on the market today. We’ve shown you what the BEST look like. 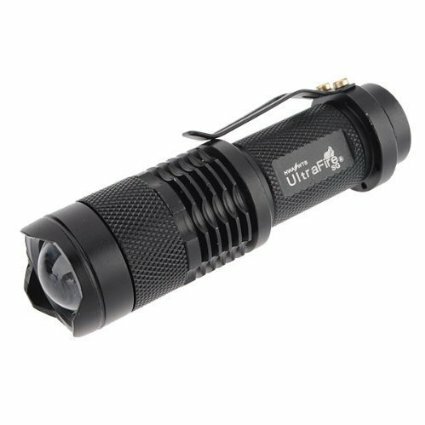 For the very budget conscious consumer who isn’t going to want to use the flashlight ALL the time, the UltraFire Mini Cree is great. If you need something averagely priced, the Streamlight is your man. Need something super bright and powerful? Opt for The Torch! 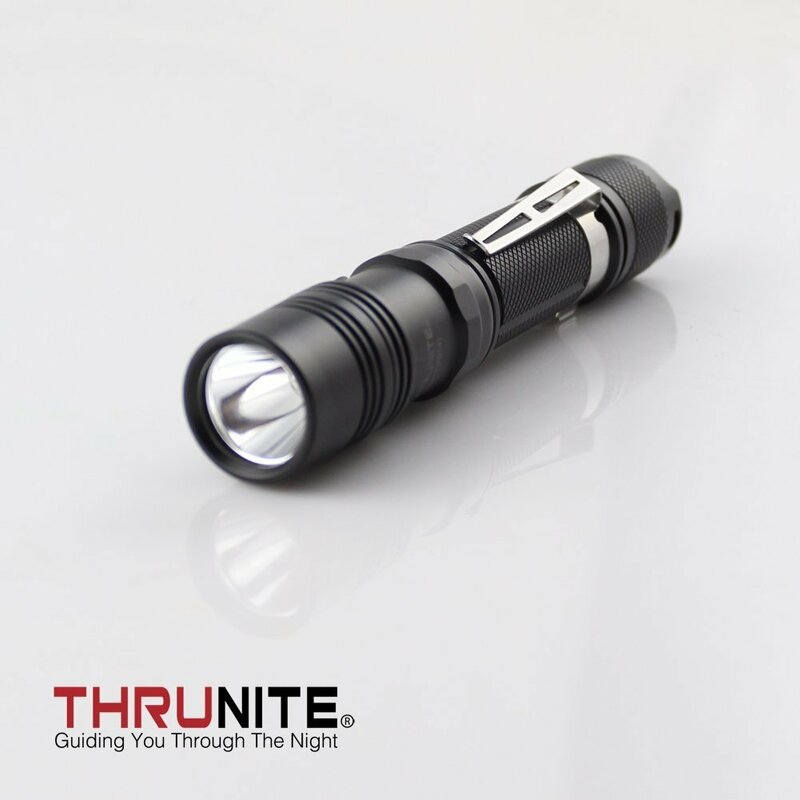 And if you have more to invest and need a great warranty, the ThruNite is your best pick. 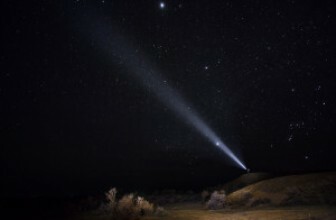 So what’s our top pick for The Best Cree Flashlight? It has to be Wicked Lasers – The Torch! 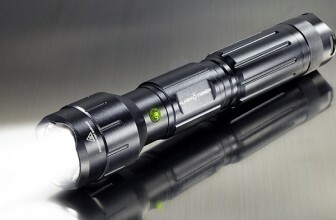 It’s been called the world’s most powerful flashlight and with good reason! Wicked Lasers really put out their best product when they invented The Torch. Sure, you’ll have to fork out a pretty penny if you’re going to invest in it, but it just might turn out to be one of the best investments you ever made. 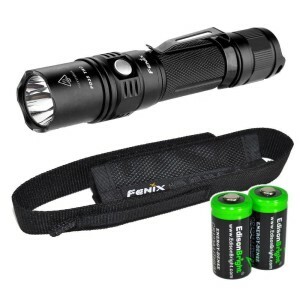 Fenix separates their flashlights into various series, one for each category of customer. 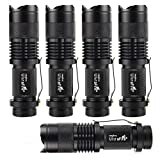 The most popular flashlights being from the PD (Portable and High Intensity), LD (Professional Outdoor), TK (Tough and Powerful) and E (Everyday) series. We will go through an example of each of these below.In their ten years of business, Fenix Flashlights, has been the recipient of multiple awards of excellence. Most recently, Fenix won “single-product brand of the year” in the 2013 Outdoor Industry Annual Awards in China. Fenix is well respected throughout the world, selling in over 100 countries, to hunters, military and law enforcement. 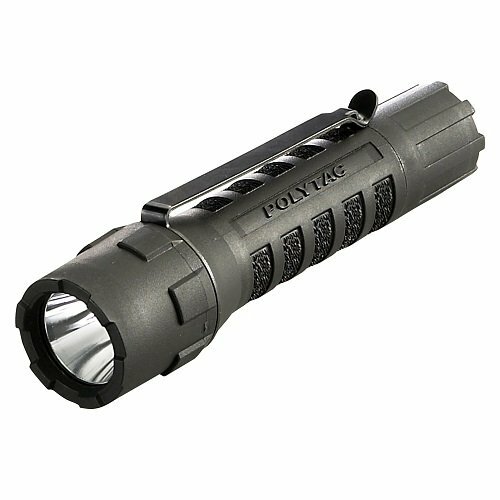 The PD35 is one of the brightest flashlights available in the lower price range, with 850 lumens under its belt the PD35 has a powerful beam. For less than blinding light, however, there are multiple modes that are easily selected by a side switch. The Eco setting at 10 lumens is not very effective for outdoor use, but once you get up to Turbo at 850 lumens it is brighter than a headlight and incredibly effective for outdoor, long-distance use. The variable modes make this is an excellent choice for a professional law enforcement official or a backwoods hunter. With a great Cree LED lifespan of 50,000 hours, you’re guaranteed never to be left in the dark again with this great Fenix LED flashlight. This bundle comes with two rechargeable lithium batteries. 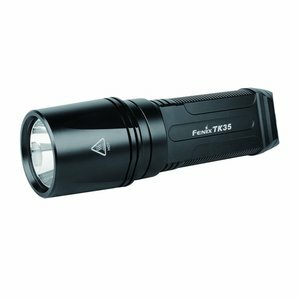 Quality is never a problem with Fenix flashlight, and that is particularly obvious with the PD35. 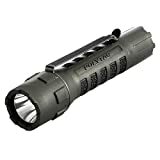 Like most Fenix flashlights, it is made of aircraft grade aluminum with an anti-abrasive finish. This combination makes the PD35 stand up like no other brand. With a short length of 5.5 inches, the flashlight is very easy to pack, without being bulky. This is one of the best tactical flashlights available and a great value. The TK35 is the flashlight that definitely gives you a decent bang for your buck. This model ha s a hefty 860 lumens to it with four brightness levels and two flashing modes that are easily chosen with a dual tail switch. The long run time sets Fenix apart from other companies, as the turbo level (860 lumens) lasts 1.5 hours, and the low level (15 lumens) will last 130 hours. Being waterproof up to IPX-8 standards (immersion over a meter) as well as impact resistant makes the Fenix TK35 an excellent choice for those in the police forces or military, or hunters that want a serious light to rely on. Weighing only half a pound is part of what sets the TK35 apart from other heavy duty lights. Other lights can weigh up to 5 lbs, but the TK35 provides you with all the power but much less bulk so you can easily carry the flashlight in one hand, and your weapon in the other. 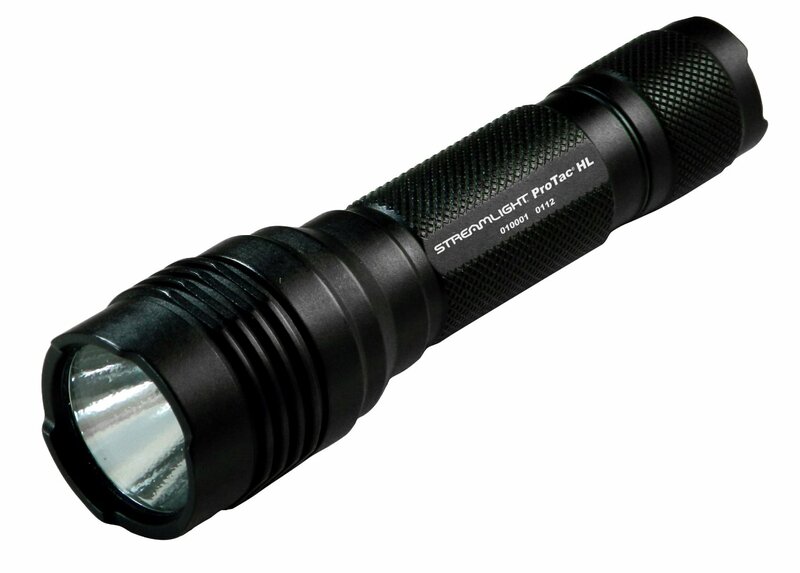 The E21 is an excellent choice for those needing an everyday, quality flashlight. 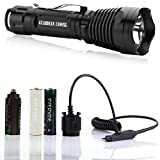 It has lower lumens than the flashlights previously discussed, but 154 lumens is all that is necessary for lighting for casual night walks or power outages. Only weight 0.2 pounds, and being six inches in length makes the E21 perfect for storing in your backpack or glove compartment for emergencies. This model has a long lifespan of 50,000 hours and a run time of 11, so being stranded without light is not an issue for me with this flashlight. 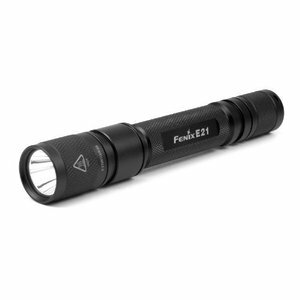 The Fenix E21 has two modes, flood and focus, that are easily changed by twisting the head. Most everyday flashlights are toast as soon as they have contact with water or are dropped a few feet, luckily Fenix has addressed this by making the E21 waterproof to IPX-8 and impact resistant to one meter. Having these features definitely brings the Fenix E21 flashlight steps above average flashlights. The LD41 is the perfect choice for outdoorsmen, whether it be a mountain climber, caver, or extreme sports enthusiast. 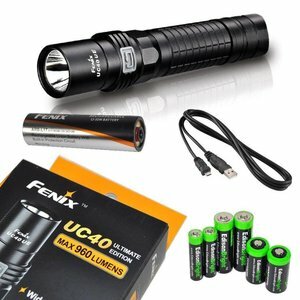 This Fenix flashlight offers four different brightness modes and two flash patterns for emergencies. With a turbo mode of 520 lumens, it can light up a cave or a forest excellently at night. The LD41 has a great run time on all modes, on the turbo, it lasts more than 2 hours and more than 160 hours on low. A runtime like this provides a reliable flashlight than you can trust if you are stuck in a tight spot. To increase the durability of the LD41, it is protected up to the IPX-8 standard for waterproofing and an impact up to 1 meter. 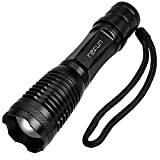 Fenix has also utilized a toughened, ultra-clear glass for this flashlight so you can trust it not to break on you. 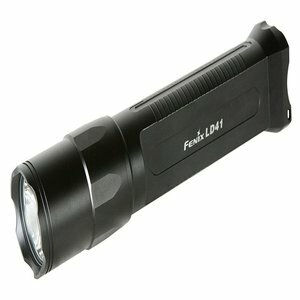 The combination of these elements makes the Fenix LD41 a great investment for anyone who relies on a quality flashlight for work or pleasure. The UC40 is one of the better rechargeable tactical lights on the market. The UC40 spills a ton of light and includes four different modes.Turbo, High, Mid, and Low. The max lumen output is 960 while the highest output is 10 lumens. A few knocks on the Fenix UC40. Overall it’s a killer light, however, it may not be as suitable for law enforcement or other professionals who would be using a gun. There are a few reasons for this. First off, most tactical flashlights have the on/off button located on the tail cap. The reason for this is because the tail cap is a more logical spot when you’re firing a pistol. It also doesn’t have a momentary on the setting. Lastly, the light is 0.9″ which is an awkward size if you’re ever planning on mounting it to a weapon. The USB charging feature is terrific, it literally gives you the ability to charge your light anywhere. In your car, at your house, the office. The first thing that stands out when the Maglite Heavy-Duty Flashlight arrived was its size. This tactical light isn’t meant to be small, light or discrete. It weighs 14.1 ounces, it’s over foot long and is two inches in diameter. It’s constructed out of high-quality anodized aluminum, I’m sure the cops who carry this light in my district have used it beyond just as a means to see. Surprisingly, despite its size, it feels comfortable to hold. It’s not ideal for use if you’re trying to use a pistol on the other hand as the on/off switch is located near the front of the flashlight. Ideally, you want a small compact light with the switch at the rear, if you’re planning on using it with a weapon. Durability:- If you’re going to make a massive light that looks like a nightstick, at first sight, you had better make it durable. Mag-lite isn’t strangers to building high-quality tactical flashlights, and deliver with the S4D016. I’ve dropped this sucker off of a roof and it still works! It’s also been used a general purpose hammer to pound tent stakes into the ground at 2 in the morning. Talk about handy, a light source and a hammer! The switch is made out of rubber and all the o-rings are made from high-quality silicone. You can bet on this keeping the water out during a downpour. Always a nice feature when you’re camping trying to set up a tent and 1 in the morning!I’ve never personally bopped anyone on the head, but it defiantly could serve as a self-defense tool under the right circumstances. This is the light I always take when I walk the dog at night, just in case. Lumens, Settings, and Battery Life:- The light is not overwhelming, it’s bright but it’s not going to blow you away with (it’s not a Streamlight Strion, but it’s also not your average cheap plastic flashlight from your hardware store). 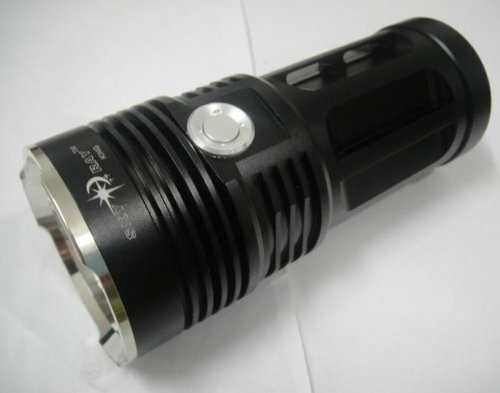 It has 70 lumens and a run time of ten hours, which is exceptional. The best part about this flashlight (aside from the fact that it can be replicated a hammer or a nightstick) is the option to go from a light beam to a flood light. Rotating the head will turn your focused beam into a wide one which can be ideal for certain scenarios. Maglite has a solid reputation within the industry, they make quality products at a reasonable price. 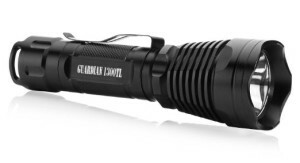 You’re not going to find a lot of flashlights that outperform this one for less than $20. 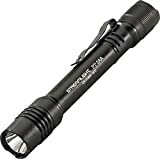 Sure, it’s more expensive then the cheap ones you can buy from the dollar store or home depot but it won’t even compare.If you’re looking for a good flashlight for home, outdoors or for professional usage and you don’t want to spend $35 or $40 dollar this is your ticket. Most of the customers have sung it’s praise. Streamlight has been perfecting flashlights since their conception in 1973. With over 40 years in the business, Streamlight flashlights have become very well known for their quality. The tagline they use is “Heroes Trust Streamlight”. The company has worked hard to maintain the motto, consistently checking with their customers about things that could be improved. Streamlight carries a wide variety of products for every use. From rail-mounted lights for your pistol, tactical flashlights and even floodlights for your crime scene they have you covered. Below, we will discuss some of the most popular ones.To further their knowledge of what customers need, they regularly participate in training courses for firefighter, hunters, etc. to find out issues you only realize in the field. Working in the field is part of the reason for the lifetime warranty offered with all of their products. We all know things happen while working, whether it be the manufacturer’s fault or ours, it’s nice to know they have our backs. 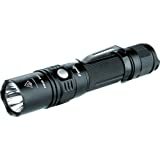 The 88040 gives you amazing value for a low price, it might be the be st flashlight on the planet. 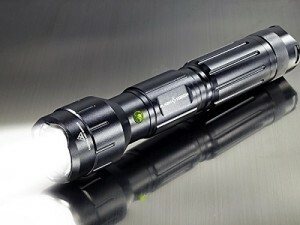 It has a powerful 600 lumens to its name, providing an excellent beam to light up a dark alley at night. 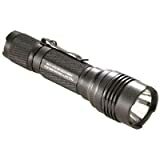 The 88040 offers a TEN-TAP programmable switch to alternate between 3 different function options, making it a customizable flashlight that gets the job done. The highest setting, at 600 lumens, lasts for over an hour while the low setting will last 18 hours. Using C4-LED technology, it provides a very bright beam. Between these options, this flashlight will easily suit many needs. 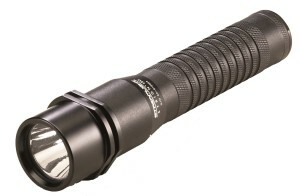 The Streamlight 88040 also offers a strobe function for emergencies. The construction of Streamlight flashlights is impeccable. The 88040 offers an impact resistance of one meter and a water rating of IPX-7. With this rating, the flashlight can safely survive submersion of one meter. This light is also secured with an O-ring sealed glass lens so no water should be making it inside! 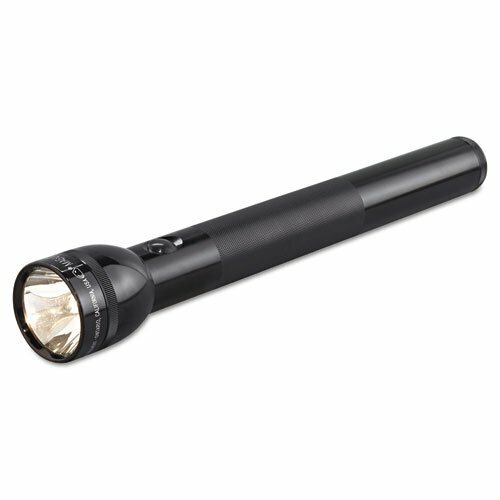 With an anti-roll head and small diameter, only one inch, the Streamlight 88040 is an excellent option for law enforcement or security officers. Streamlight’s 88850 is a perfect option for someone needing a versatile light. 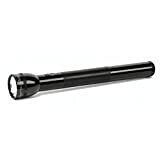 This flashlight is small and durable, can easily be used with a shotgun mount or on its own. The 88850 has lower lumens than others, but it does the job with 275 lumens in the high mode and 14 in the low mode. It has an incredible life at 65 hours on the low mode. Like the 88040, this Streamlight flashlight uses C4-LED which is three times as bright as other LEDs available. Also adding to the illumination, is the reflector around the LED which provides much more peripheral lighting. The 88850 is operated by a tail-cap push-button, making it very easy to switch between high, low and strobe as well as the TEN-TAP modes. The tail cap button is also convenient for use with a gun mount, such as the Elzetta. If using attached to a gun, the 88850 is unlikely to be submerged in water, but for other uses the ratings are important. This Streamlight is rated to IPX-7, submersion of one meter, and is resistant to impacts of one metre as well. If something does happen to your flashlight, the lifetime warranty should keep you covered. The 69110 give you great value for a weapon light, at half the cost of competitors but with no hit to quality. This light can mount directly onto to Glock or Picatinny style rails making it an obvious choice for many buyers. If your weapon doesn’t fall into the above categories, the Streamlight 69110 also includes keys for attachment to Beretta or S&W rails. This light is a bit on the hefty side, at eight ounces, but if your pistol or rifle already has a decent weight to it, the Streamlight’s weight shouldn’t bother you. As for the light itself, it packs up to 135 lumens with a run time of 2.5 hours. Like many Streamlight models, the 69110 takes advantage of the C4-LED and reflectors to really pack a punch. These additions make it up three times brighter than other LEDs and add a lot of spill peripheral light. It can easily by operated by an ambidextrous switch that can be used by your trigger finger or thumb depending on positioning. There is also a lock-on option, so you don’t have to worry about accidentally flicking off your light and being stuck in a tough situation. 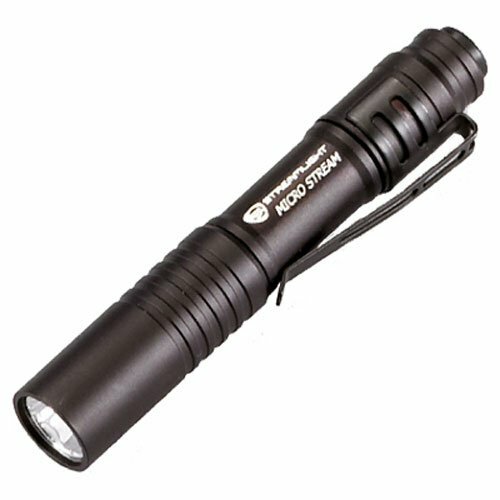 The Streamlight 69110 is a great option for anyone from law enforcement to homeowners looking for a little extra help. f 35 lumens for a runtime of 2.25 hours. The Streamlight 66318 is easily operated by a push-button tail switch, allowing the option of continuous or momentary power. 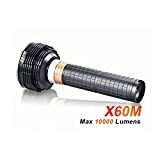 This flashlight, although reduced in size, does not reduce in quality. This light is protected from water to a standard of IPX-4, meaning that splash from any angle will not harm the 66318 in any way. 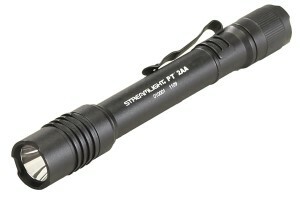 This Streamlight is made of Type II MIL-SPEC aircraft aluminum, protecting it from any abrasive or corrosive materials. All in all, this is an excellent option to keep with you at all times, whether it be under your dash or in a pocket. Our number one choice for police officers and professionals alike who are looking for a high-performance flashlight for their everyday needs is the Streamlight Strion LED Flashlight. Extremely compact while packing a powerful punch, the Strion offers users the perfect everyday flashlight plus a light to rely upon in the most intense of conditions. The Strion feels great in the hand weighing in at 1.8 pounds it definitely doesn’t feel like a toy while it also won’t weigh down your belt too much. In length, it’s just over 8.5 inches which we find to be a good size. It probably won’t back you up as the club like the Maglite S4D016 but it sure is maneuverable for more intense situations. The case of this tactical flashlight is made of 6000 series machined aircraft aluminum with an anodized finish which means you can be rest-assured the Strion won’t crack on you if dropped. The lens is made of a high -temperature Borofloat glass which is extremely resistant to thermal shock. The body of the Strion also includes an anti-roll head and a multi-functional rubber push-button tactical tail switch. This model can also attach to a long gun mount at the barrel of the flashlight is grooved. We tested out the claim that this design was, in fact, water resistant and was impressed with just how well it held up in a tank of water. Not a drop got through to any electrical components. The Strion offers three microprocessor-controlled intensity modes including a high medium and low setting and a strobe setting. The high setting offers up to 260 lumens and a distance of up to 200 meters which is fantastic for the outdoors or in a building which requires a high-intensity beam. Unlike other models, you don’t cycle through the intensity levels by rapidly clicking on the on/off switch. Instead, with the Strion you click and hold the button in and it rotates through the three settings. A pretty slick feature. Shining the Strion on a high setting in the eyes of an intruder is blinding, allowing you to use the beam as self-defense and attacking tool. Both the medium and low settings have a lower lumen level but also increase the battery life, which maxes out at 7.5 hours on the lowest setting. On its highest setting, the battery life is just around 2 hours. 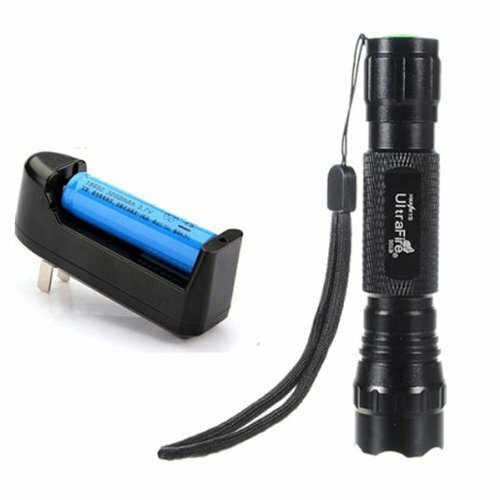 Although you may pay a little bit more upfront for the Streamlight Strion, you have to take into account that it does feature a rechargeable battery and it ships with one charger/holder. Over time, the Strion actually will save you money compared to other models as you won’t be required to replace expensive batteries. Charge wise, the Strion can be recharged about 500 times which means you won’t need to worry about the battery draining after just a few uses. If something in your battery goes defunct or you have had this model for a couple of years, the rechargeable battery is also replaceable for under $30.00. This very well may be the last tactical flashlight you will ever need to buy. The one lacking feature of the Strion is the ability to focus your beam however it is only a minor issue. The beam strength and multiple intensity options allow you to have enough control over your beam where you won’t miss having the option to focus.Over 250 reviewers have given this model the thumbs up. 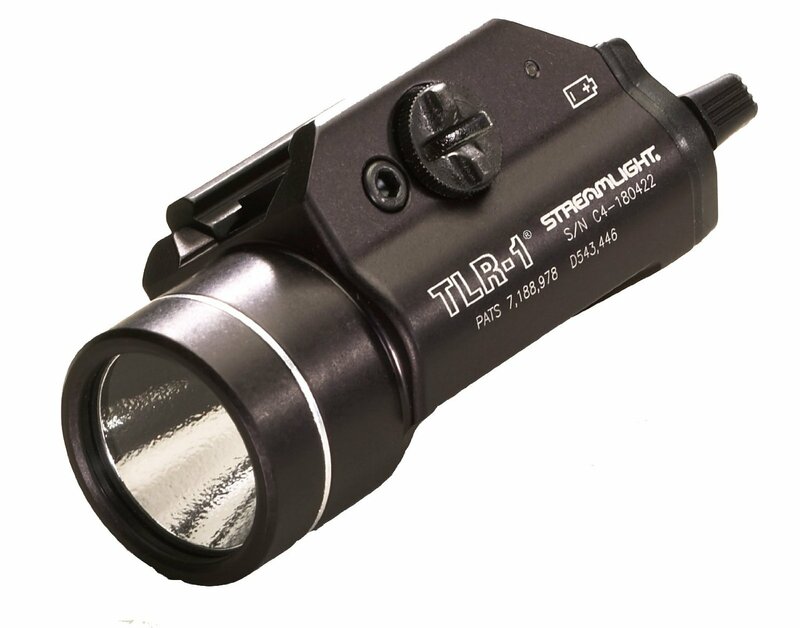 Like ourselves, not many folks have negatives things to say about this Streamlight product. 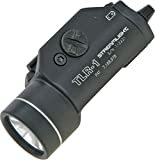 Overall it received 4.7/5 stars from 277 reviewers, a pretty impressive track record.One of our favorite models of all-time the Streamlight Strion is highly recommended for police and other security professionals alike. This flashlight has a runtime of 295 hours on the lowest setting and a runtime of 2.2 hours on the highest setting. It’s compact and the bright LED will help illuminate even the darkest of spaces. Shining in at 600 Lumens thanks to the C4 LED, this flashlight from Streamlight is a really reliable and hard working tool. It’s impervious to shock and waterproof to one meter. 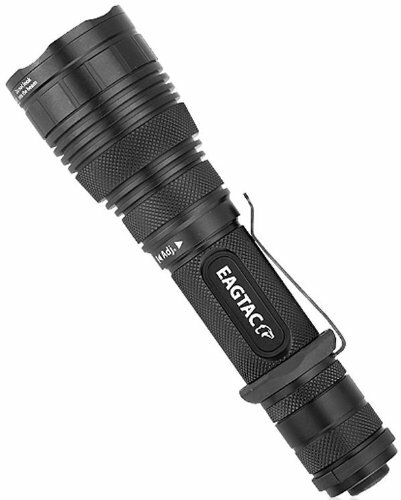 Yes, it’s a super long name, but the EagleTac can put out up to 1180 lumens for 1 hour and has a beaming distance of up to 295 meters. The EagleTac is also waterproof. Batteries not included. 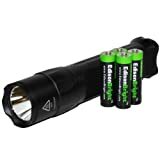 1300 lumens of light and runs on a rechargeable lithium battery; it also encompasses the BrightSmart technology, which helps to regulate the battery power. ILLUMINATION: Confidently navigate your way through the darkness with the Guardian 1300XL tactical flashlight. The intensity of the Ultra-Bright LED bulb generates a blazing brightness and a larger area of focus essential for police and military professionals. A stunning lighting distance of 300 yards (about 3 football fields), puts the spotlight on outdoor adventures whether you are camping, biking, hunting, hiking, or fishing. VERSATILE: High, Medium, Low, Strobe, and SOS modes with BrightStart Memory Technology and Remote Pressure Switch offer an all-purpose, compact tool for hunters and law enforcement. TWO Rechargeable Lithium 18650 Batteries + Charger creates hours of run-time. WARRANTY: As with all of our products, the Guardian 1300XL comes with a 5 Year Warranty* and our No Questions Asked Return Policy, so you can rest assured there is absolutely no risk to you! Something POWERFUL and fully rechargeable AND has a long run time WITH a tactical security design? YES, the Solaray PROZX-1 seems to have it all in one hamper! Constructed from rugged aircraft grade aluminum with an attached deluxe lanyard. Professional grade yet lightweight and durable makes this an essential piece of equipment for travel, outdoor sports and bug out bags. Solaray is proud to be used by police and fire departments nationwide as well as FBI, Homeland Security, Coast Guard, and working professionals everywhere. 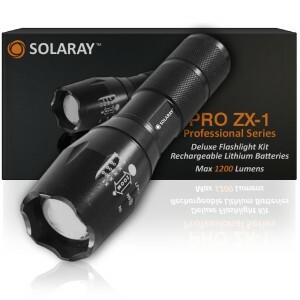 Click "Add to Cart" now and see why so many choose Solaray to light their way! red signal lights, charger, rechargeable battery, and two lithium batteries. If you need bright in ALL its might, then The Torch is your answer! Capable of producing a wh opping 4100 lumens of intense light, The Torch lights your world unlike any other flashlight out there. The halogen lamp lasts up to 2000 hours. 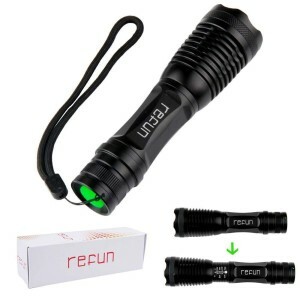 Offering you a powerful 2000 lumens of light, the Refun flashlight is sure powerful given its small size and the low price. Has adjustable focus range, is skid proof and water resistant, and 5 switch modes. Energy-efficient despite the high-powered functionality light is environment-friendly and cost-efficient. Bulbs last more than 100,000 hours. 100% satisfaction and money-back guarantee. Modes: Adjustable focus range for different usage, stretching to adjust 5 Mode,high brightness; Medium brightness; low brightness; Strobe (intermitent flashing). 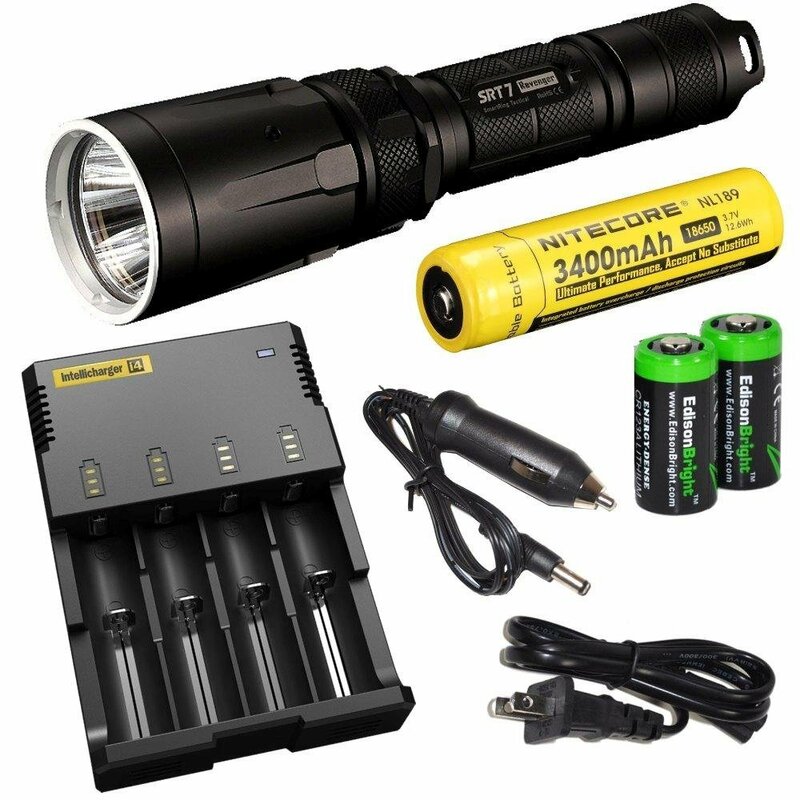 This is one of the most powerful high lumen flashlights that you can buy today. By NO means is this one cheap, but the very best never is. You get 10,000 lumens that can reach up to 525 meters, which makes for one hell of a tactical flashlight by the way although it’s going to cost you a pretty penny.A bit more of an investment for the very best quality, that seems to be Supbeam ace beam. 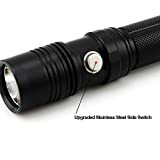 This flashlight is super powerful and has some great features, and you’re bound to see the world after dark from a totally new perspective once you have this beast in your hands. Generally, 1000Lm lights are used in special circumstances such as search and rescue. And usually, 1000 lumens is overkill for the everyday user. 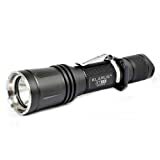 If you’re looking for a light to take the dog for a walk or as a nightstand flashlight you might want to look at something that is a little more practical such as the Maglite S4D016 or a Streamlight 88031. That said, sometimes you just want to throw a lot of light – it doesn’t always have to be logical. 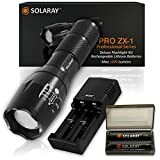 I’ve focused on a variety of price points, your higher end flashlight built right here in North America, a middle of the road model and then a cheap knock-off built in China. There is nothing wrong with the knockoff, but don’t expect the same reliability (or any at all for that matter) and bear in mind a 1000 Lm $13 flashlight isn’t going to throw anywhere near 1000 lumens. The P3X is at the top of this list for reliability, usability, and overall functionality. Of course, that comes at a price and the Fury is one of the more expensive lights on the market. It only has a single LED bulb but still gives you the option for either 1000 Lumens or 15 Lumens depending on the situation. This is particularly useful if you’re in the middle of nowhere or need to extend the battery for any given reason. Even when cranking out 1000 lumens the P3X runs for 2.25 hours, which is fairly impressive. While running at 15 lbs it lasts for 60 hours. As you would expect with any Surefire, Fenix or Streamlight product it’s practically indestructible. The high-end brands create flashlights out of quality material like aircraft aluminum, shatterproof glass and high end LED lights. 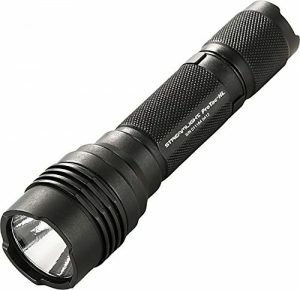 If you’re looking for a relatively inexpensive flashlight for every day use the MECO Cree T6 is a pretty slick option. It’s incredibly cheap so you may want to pick up a couple just so you always have a backup light. It’s nowhere near the 1000 lumens it is advertised at but if you know that going in you’ll appreciate this handy light. When we tested this sucker we got 489 lumens out of it, which is actually pretty damn good for a light that costs less than $20. It isn’t terribly reliable and the one I kept in my car up and stopped working one day (which is why I suggest buying two). This obviously isn’t ideal – if you need a flashlight odds are you really need a light. It’s a complete piss off when it stops working. Materials: Made of ABS materials and T6061 aircraft aluminum alloy. 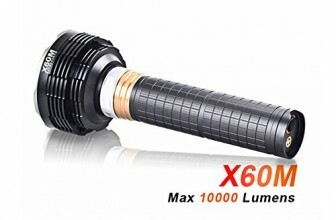 Light Source: CREE XM-L T6 LED, ultra-bright and long lifespan. Richly After Service: 30 Days Money Back Guarantee, 12 Months Warranty! This flashlight falls somewhere in between the MECO and the Surefire. It’s more reliable than the MECO but clearly made from cheaper materials than the Surefire. ist. It features 3 CREE LED lights which throw a ton of light. The Sky Ray is less of a tactical flashlight and more of an everyday light for an average user. It’s one of the better lights on the market for everyday use – perfect for camping, hiking or any other outdoor activity. Even though it comes up well shy of it’s advertised 3800 Lumens it still throws a ton of light.